The project started in April 1998 and lasted 4 years, and was designed to house the newly formed Greater London Authority. The GLA was established by newly elected prime minster Tony Blair, who wanted to bring back localized government, something London had not seen since 1986. There had previously been the Greater London Council, which was led by Ken Livingstone, a Labour MP, at the time of its abolishment by Prime Minister Margaret Thatcher with the local government act 1985. The GLC was abolished due to beliefs that it was been controlled by Labour Party views. Tony Blair established the Greater London Authority Act in 1999, and after a local referendum, Ken Livingstone was elected as the first mayor of London in 2000. It was a controversial election, as after been snubbed for the Labour candidate, Ken Livingstone stood independently and was subsequently expelled from the Labour party. A competition in 1998 was held to choose a site and design for the new office of the GLA. There were 55 entries, and 7 were chosen and displayed in an exhibition in the OXO tower wharf in 1998. Visitors of the exhibition were asked to provide feedback and vote for their favorite design. Foster & Partners design, headed by Ken Shuttleworth, was voted the public’s favorite. While the building was been constructed the GLA had to “squat” in a disused government building on Marsham Street, Westminster. The city Hall in London is set at the latitude and longitude of 51,32N AND 0,5W. This positioning is important in terms of the angles of the sun, which are equivalent to Southern Ontario global position. The sun pattern means that the City Hall receives most of its direct sunlight from the south while little to no direct light comes from the north. The path of the sun and its effects on the building completely shape the outer form. A steel and glass ‘egg’-shaped building, designed in the same way as the glass dome on the top of the Reichstag, to be sustainable. Norman Foster used the idea of sustainability as a starting point and he wanted to prove that a sustainable building could be both aesthetical and efficient. This sloping ‘helmet’ shape is created by each individual floor on the south side being designed to rise over the floors below creating a natural shading effect as this protects from the direct solar glare. There were no concerns for solar shading on the north façade because of the minimal direct sunlight it receives. The views were the primary concern here. The cladding, a triangular transparent glazing, actually extends the head of the helmet and allows views of Tower Bridge and the Thames. Each floor is stepped back from the one below allowing for a paramount view of the surrounding area. This creates a sphere, which importantly has 25% less surface area than the conventional cube building shape. The reduction in surface area leads to a reduction in heat loss. The outer cladding that covers the building gives the appearance of transparency yet the building is in fact 75% opaque. Each individual panel is tinted green as this reduces the amount of harmful UV rays that can transmit through the panels while allowing the interior to increase in heat. It is only the north side where completely transparent panels are used, for reasons of enhancing the view and to make sure there are no obstructions. The three other faces of the structure are clad with an insulated aluminum. The aluminum panels were not placed randomly, a miniature heat model was made and marked where the most heat was lost, and then used to calculate solar gain. There was then analyzed sunlight patterns and light penetration, to calculate which parts of the façade would be transparent .The building is completely triple glazed, these glazing panels all have solar blinds that also block the UV rays and create a greenhouse effect inside the building. All of these components are used to reduce heat loss from the building and to improve its isolative properties. The ventilation of the building is extremely simple and moves away from traditional mechanical heating and cooling systems. Foster and Partners opted for a natural ventilation system. There are operable vents in each separate piece of cladding. These vents, when opened, deactivate the automated heating systems in the area of the building where the vents are opened. This leads to saving energy as both systems are never used at the same time and as often as possible the natural system is used. In addition to this there is also a vent above and below the panel, which allows cool air to flow in, reducing the heat in the room, which then escapes through the top vent. 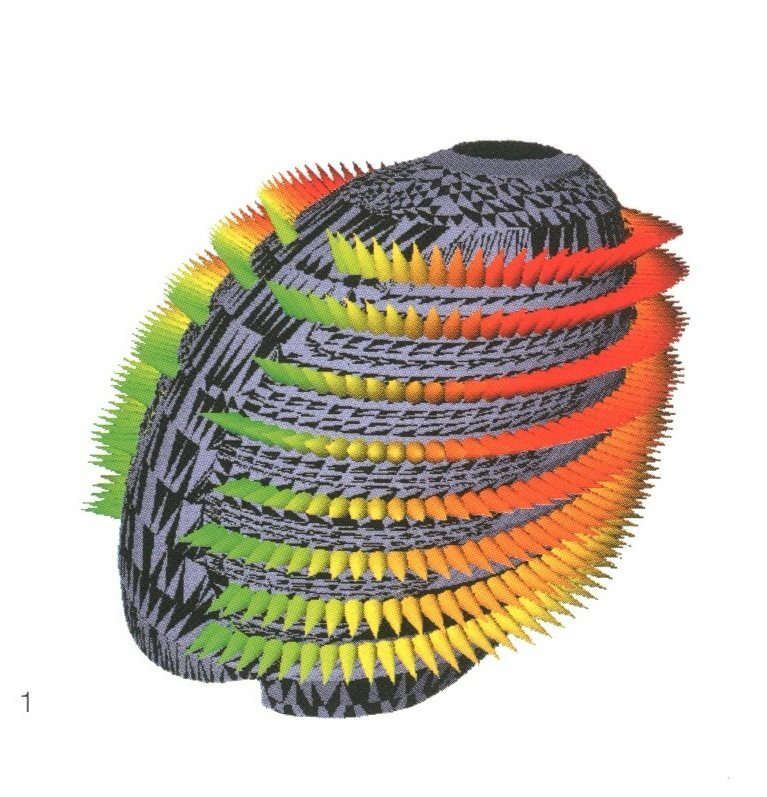 These vents are installed primarily in the South, East and West section of the building. Whereas the north side, which contains the Assembly Chamber and the Committee room, is heated and cooled by automatically operated vents, which act to control the temperature in the summer. The building is heated by boreholes, which reach 427 feet down into the ground piercing the water table. These pump water up from the ground and circulate it round the building and are used for heating and cooling purposes. The actual system is incorporated into the structure of the building too which acts in saving space and materials because it works as part of the framework. The water is pumped out of the ground at 53-57°F and then runs through the structural beams in the City Hall. In the hotter months this water is run through cooling coils, which are filled with cold air. This system cools the water that run through these pipes, this in tern is moved around the building cooling each room as it runs through. During winter and the colder months the same process is replicated but the water is pumped through gas-operated boilers. Then through the same process, and through radiant heating, the water heats the rooms as it runs through them. Every office and the debating chamber are heated by convector heating using water from the boreholes. In a similar vein the heat from the computers and the operating systems is also collected. This is then used to re-heat the building. These methods are much more energy efficient and cheaper than typical routes used by other company’s. Although, this type of heating is rarely used in buildings as big as The City Hall as it takes a lot of money and time to originally set up. There is a highly technical side to the pumping system, which acts to save energy and resources. They have the ability to work at multiple speeds and functions. This allows for them to pump exactly how much water is needed depending on how hot or cold the structure is. This means that water is not needlessly pumped around the building and isn’t wasting energy on heating excess water. After heating the building, the water is then moved and not wasted by being used for the plumbing systems and in the toilets and urinals of the building. Sustainability is an important part of the building, though that is not immediately apparent. The building has a mass of technical systems that although were expensive to construct are now saving power and energy. This is a completely different method of sustainability than in the majority of cases, the building is made entirely out of modern day materials. 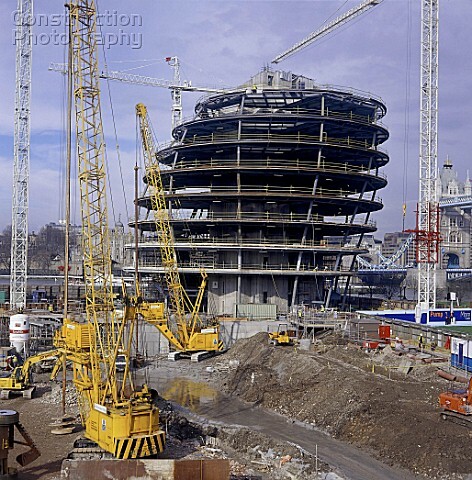 There are no natural materials; instead, steel frame, reinforced concrete and glass cladding have been used. The materials themselves are not at all associated with sustainable design or ‘green’ architecture yet it has still created this building that has reduced the energy load by 75% in comparison to a building of the similar size. The building construction was quite efficient, considering that it only took 30 months to complete the build. This included prefabrication using CAD/CAM manufacturing for several parts of construction and cladding. 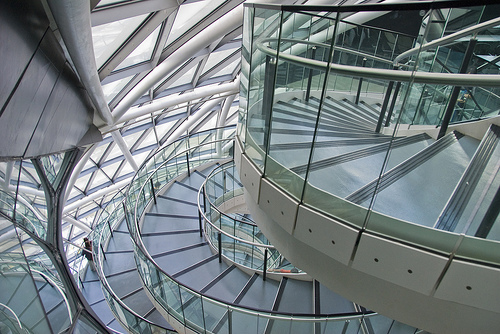 Each of City Hall’s glass panel is unique and are cut by a laser, in total 3,844 triple-glazed panels. For construction, low E glass, incorporating shading devices have been used. Two generic cladding types were used, comprising a unitized thermal flue curtain wall construction for the offices, and a toggle-fixed steel and glass design for the more public areas. The office cladding consists of 1.5m wide modules. Each panel is an individual storey-height flue with an inlet and outlet for natural ventilation with manually operated opening vents at high and mid level. Inside the building, quite a few elements, such as floor tiles and rubber doormats are made of recycled materials. The building has long-lasting lifespan in terms of structure, materials and functional flexibility. The structure slants to optimise self shading against direct sunlight. 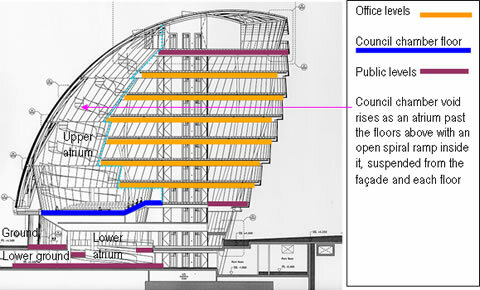 This move away from conventional modes of sustainable architecture is part of the ‘Eco-technical’ approach that foster and partners are by far leading parts of and it is clear from the London City Hall that these methods are clearly effective. Sustainability is key for this building, despite this, the 2012 energy performance operational rating was a grade D. Although this is an improvement, as in 2008 it was graded E, this doesn’t suggest that the building is as sustainable as its extensive technology wants you to believe. The reason for this is thought to be due to the building operating with twice the capacity it was designed for. Is this because of spending cuts by the government? Or is it bad planning and management on their part? 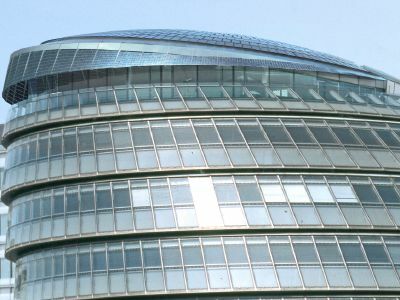 However, according to the GLA’s website, the Mayor is pledging to reduce the City Hall’s carbon emissions; stating that since completion they have: installed photovoltaic panels, are using voltage optimization technology, have installed motion sensors to reduce lighting use-age, and are assessing the occupation times of the building. Over the past two years the carbon emissions of the building have reduce, although not significantly. Is the building part of a misleading propaganda scheme by the GLA, to support their environmental policies? Or is the GLA failing to meet their eco standards due to pressure to make cuts, from the central government? [i] Foster, N. Rebuilding the Reichstag. Overlook Press, 200. Norton.M, London City Hall. London, England, Foster and partner Architects Limited.